They get me when the first veterans march by. World War II vets, white-haired but proud, followed by the men and women who served in Korea, Vietnam, the Gulf, and now Afghanistan and Iraq. It’s the Independence Day parade in Edgartown, Martha’s Vineyard, and I can’t seem to keep my eyes dry. I’ve celebrated July 4th in a lot of places (including overseas), but there’s nothing like a small town parade to make you feel proud and American. This Independence Day marks another celebration for the Raichlen family (which includes all our hardworking friends at Maryland Public Television, Resolution Pictures, Workman Publishing, and of course our own Nancy, Joanna, and Molly Kay): the official launch of my new TV show, Project Smoke. To find out where the show airs in your area, click here. And if it’s not yet airing on your local PBS station, call them to, er, light a fire under the programming department. If you are watching it, tell us your favorite dishes and what you’ve tried from the show. Wishing everyone a happy, safe, and patriotic 4th of July. 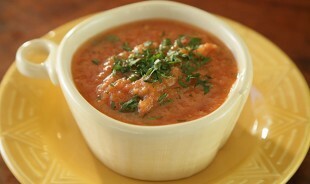 Smoked Gazpacho: I welcome any excuse to use my handheld smoker, the appropriately named Smoking Gun by PolyScience. It resembles a small battery-operated blow dryer with a rubber hose attached. You fill a small chamber on the top with coarse sawdust, turn on the fan, and light the sawdust. Within seconds, fragrant wood smoke emerges from the end of the rubber tube. It’s like a mini cold smoker, perfect for foods you don’t want to subject to heat—in this case, fresh tomatoes, cucumber, onions, and bell pepper in this refreshing summer soup from Spain. 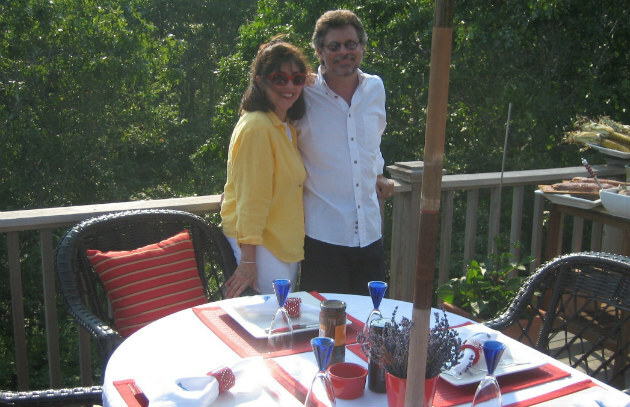 Chipotle-Smoked Oysters: Bivalves—either oysters or clams—are always on the Raichlen family’s July 4th menu. 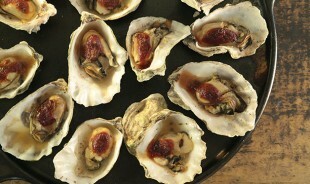 Here, oysters get a tomato-based topping with tangy horseradish and fiery chipotle chiles. To ensure you don’t spill any of their natural juices, balance the shells between the rungs of your grill grate. Or better yet, use a shellfish rack designed for the purpose. 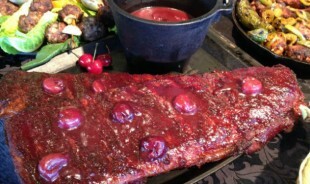 Cherry-Glazed Baby Back Ribs: Looking for something red for your Independence Day feast? Spice-rubbed baby backs get a generous dose of oak smoke before being glazed with cherry syrup. The cherry theme is reinforced with homemade barbecue sauce featuring fresh cherries, cherry preserves, and black cherry soda. If you’re barbecuing more than two slabs, invest in a rib rack. Smoked Creamed Corn: Creamed corn ranks high on the list of America’s favorite comfort foods. This dish takes only a few minutes to put together, especially if you smoke the corn and onion at a previous grill session. It was a huge hit at Barbecue University this year. Don’t own a grill or smoker? No problem. You can smoke the vegetables using the aforementioned Smoking Gun or a stovetop smoker like the one made by Camerons. Triple Smoked Potatoes: Smoke-roasted and stuffed with cheddar cheese, artisanal bacon, sour cream, and scallions, these are the best loaded potatoes you’ll ever eat. Make them up to a day ahead of your July 4th celebration and simply reheat them while you get the rest of the food on the table. Bacon-Apple Crisp: Dessert doesn’t get any better than this: apples, bacon, and whiskey get cooked under a crisp topping with real wood smoke in a soulful cast iron skillet. Although I wouldn’t object if it was served with vanilla ice cream (smoked, of course) or a dollop of bourbon-enhanced whipped cream.